SOAR Championship Wrestling: New Years Revolution! 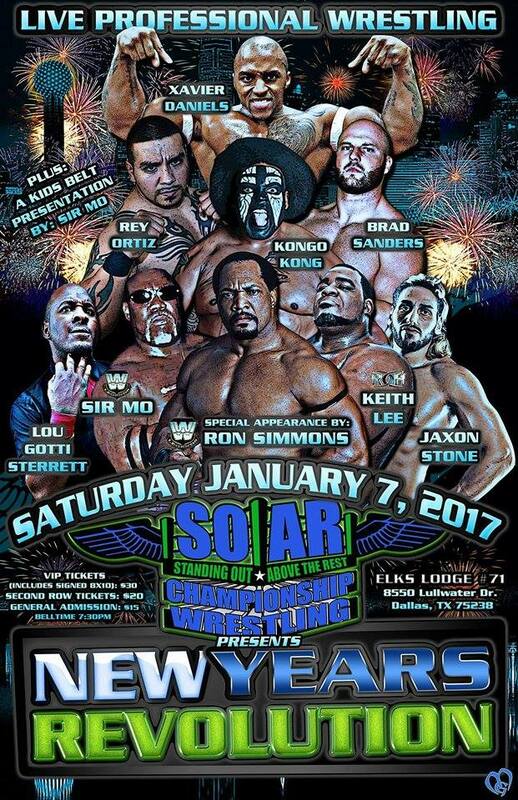 For you independent wrestling fans in the North Texas region, on January 7th, SOAR Championship Wrestling will be holding their big event ‘New Years Revolution‘ with Kongo Kong, Keith Lee, and former WWE Superstar Ron Simmons in attendance. This wrestling card looks insane and will not only be one night of chaos, but a whole weekend of fun with all of the wrestling superstars. Tickets are super cheap too, so don’t wait any longer to get your tickets! Below is the schedule for ‘New Years Revolution‘! Meet WWE Hall of Famer RON SIMMONS and former WWF tag team champion from Men on a Mission….Sir Mo. The Main event will be Kongo Kong taking on Limitless Keith Lee from Ring of Honor! We will have 6 more wrestling matches! There’s a special event for kids at intermission. Two kids will be awarded a championship belt to take home for the month of January. We are a family show but child care available if needed. We have a concession stand with full bar. Join the wrestlers for karaoke after the show. Friday, January 6th Free Pizza Party and Anti-bullying event for the kids featuring Sir Mo and Kongo Kong. Saturday Afternoon Ron Simmons is hosting a Wrestling Clinic from noon-3pm. Saturday Meet in greet with Ron Simmons 3:30-4:30,even if you can’t make it to the show that evening. WEW Podcast Ep. 13 – ‘Soar Championship Wrestling: March To Destruction’! VIP’s Holiday Havoc 3D Is Happening! This entry was posted on Sunday, December 18th, 2016 at 2:52 pm	and is filed under Events, News. You can follow any responses to this entry through the RSS 2.0 feed. You can skip to the end and leave a response. Pinging is currently not allowed. « Straight From Duckburg, The Cast For The Retooled ‘DuckTales’!! !